Aging Millikan Hall, built at the dawn of the Space Age, is being torn down and rebuilt to state-of-the-art standards over the next two years. But the iconic atomic artwork on the west facade of the building will be preserved and prominently displayed on the new building. Commissioned for Pomona College’s new math, physics and astronomy lab back in 1958, the bronze atom sculpture facing College Avenue was designed by noted sculptor Albert Stewart, whose work adorns civic buildings nationwide, including the U.S. Mint in San Francisco. 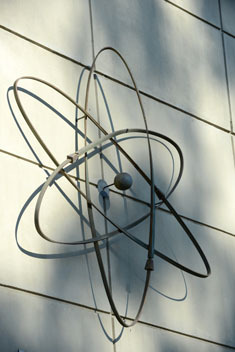 Before his death in 1965, Stewart created counterparts for the atom for the facades of Seaver North and South, with an image of cell division for biology and an array of particles for chemistry. Stewart got his start in the 1930s as an artist for the Depression-era Works Progress Administration. In 1939, he was named a professor of fine arts at Scripps College, and he soon figured in a group of prominent regional artists that included Sam Maloof and Millard Sheets. Stewart also designed and donated the Pegasus relief on Stover Walk, (though Steve Comba, associate director of the Pomona College Museum of Art, points out that the current piece is a recast from the original, apparently stolen back in the ’70s). 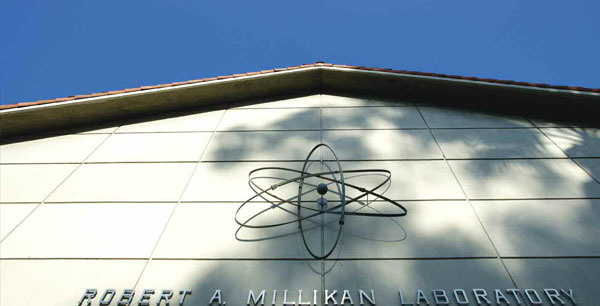 Today the atom sculpture on Millikan holds up better as art than as science. Professor of Physics and Astronomy Alma Zook ’72 calls it a “not-very-accurate representation of a lithium atom.” With our present understanding of the atomic and subatomic worlds, the three electrons circling on the atom’s fringes would be more properly depicted as a dispersed cloud, rather than the classical image of a series of orbits, like planets rotating around a sun. Nonetheless, as Zook herself notes, the design makes for a “nice threefold symmetry.” And once the new Millikan is built, the atom artwork will be returned to its rightful place over Millikan’s doorway to College Avenue as a “historical nod to the original construction,” says Andrea Ramella, project manager for the new building. Read more here about the Millikan project.